How to fly it: Paul Walker did some of the demonstration flying at the Portland stunt clinic. Here he brings his electric Impact in smoothly for a landing, illustrating how the smooth glide is part of the score. Bruce Hunt photo. May 9, 2009 2009, Portland, Ore. The Stunt clinic kicked off at 9:20 am with a brief lecture from Clinic Organizer Don McClave, about each maneuver and what common mistakes to look for. This was followed by four pilots putting in a pattern while each participant scored the flight. After the flight, Paul Walker and Don McClave talked about the mistakes they saw and how to score these mistakes. In short this was a real chance to learn how to judge, and to see what the judges score up and down for. A special thanks go out to all that help organize this event, including: Don McClave, Paul Walker, Bruce Hunt, Jack Pitcher, Mark Hansen, and Scott Riese. After the Clinic was scheduled the first official contest for NW Sport Race in the Pacific Northwest. I had high hopes for this event, as there are now four pilots in the local area with Fox racers, yet only one showed up for the event, leaving this to be a non-contest. Funny thing is we had three come for the Friday practice session each of the last three weeks prior to this event; so I am left to think that these people are more interested in practicing racing, than racing? The sole competitor to show up was: Doug Powers. Special thanks go to all that help make the racing event a success, those people are: Doug Powers, Richard Entwhistle, Mark Hansen, and Jim Cameron. Paul Walker and Don McClave led the Stunt Judges Clinic for eight or nine participants. There were four flights by Bruce Hunt, Scott Riese, Jack Pitcher, and Paul Walker. Those that attended went away with a new appreciation for the difficulty of judgeing PA. One of the main ideas McClave presented was that a judge has to judge the entire maneuver and weigh the importance of deviations from the size, shape and location. The new AMA PA rules were covered and applied when, in the first flight of the day, Bruce Hunt's Lark ran out of fuel in the overhead eight resulting in zero points for the cloverleaf and landing (minimum two laps between maneuvers). But since there are no pattern points, that is the only deduction. The last three flights were uneventful and the Judges got a good feel for the different ways pilots present the pattern. In less than 10 seconds, a judge has to decide if the corners count more than the sides of a square loop. Those involved also took away some good tips on flying maneuvers for judges. One understanding that several participants mentioned was the need to fly all the inverted laps by the book because of the difficultly for judges to consistently count the inverted laps. So on a beautiful day, a group of fliers became judges for a moment and better fliers for the understanding gained. Right: Paul Walker aims for pefect vertical climb. Bruce Hunt photo. 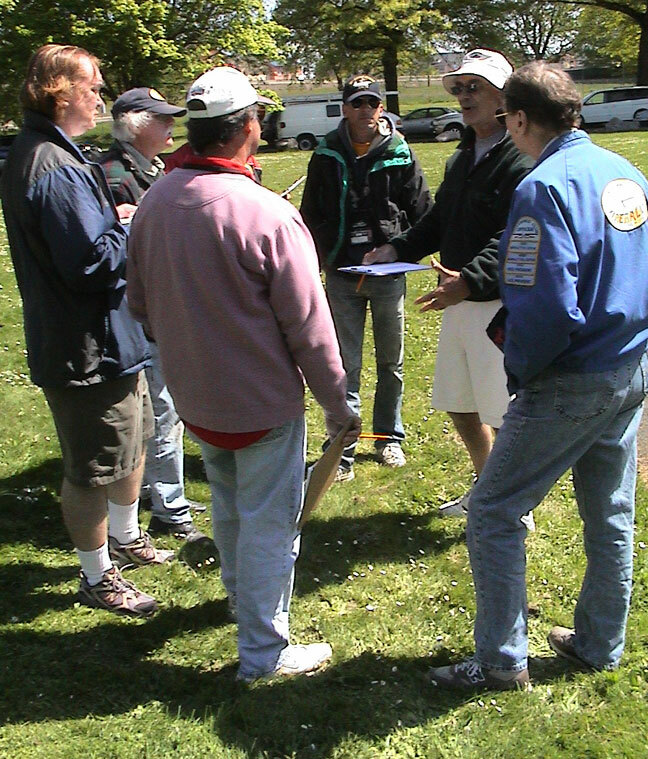 Don McClave (second from right) discusses judging with clinic participants. Bruce Hunt photo. 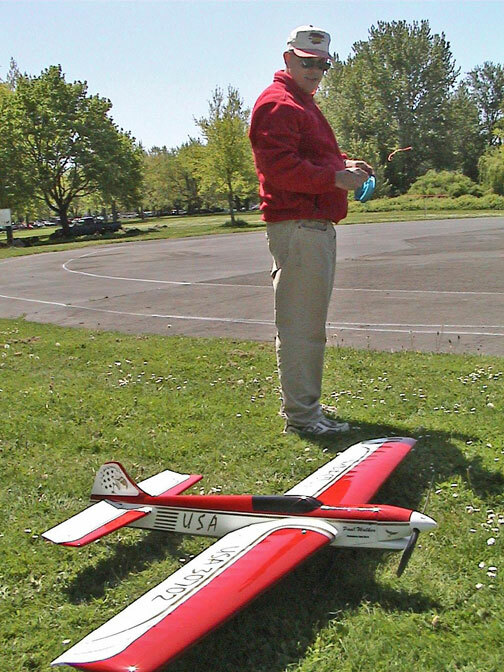 Mike Denlis prepares to launch Jack Pitcher's Centennial for a demonstration flight. Bruce Hunt photo. 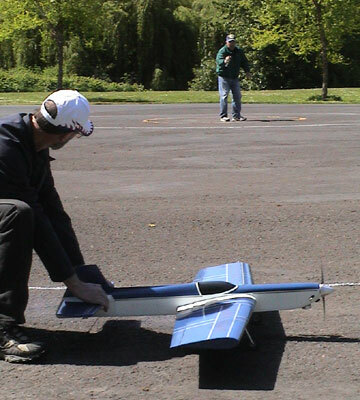 Paul Walker prepares for a demo flight with the electric Impact XLE, first version. Bruce Hunt photo.